Play It Again, Sam — Welcome to MrBatten.com! The Sheppard murder mystery began on the Fourth of July, 1954, in the town of Bay Village, Ohio (a suburb of Cleveland), with the brutal murder of Marilyn Sheppard, the pregnant wife of Dr. Samuel H. Sheppard, a handsome 30 years-old osteopathic surgeon in practice with his father and two brothers. She was beaten to death with a blunt object while in her bed upstairs, probably around 4:00 or 4:30 in the morning. Sam, a heavy sleeper, had fallen asleep downstairs, but was awakened by her cries for help. He rushed upstairs, where he was knocked unconscious. Coming to a bit later, he heard the perpetrator downstairs, and rushed to confront him, chasing him down to the shore of the lake. Sam was once again rendered unconscious. When he came to, her returned to the house, determined that his wife was dead, checked on his seven years-old son “Chip” (Sam Reese Sheppard, asleep and undisturbed in a nearby room), and then called the one telephone number that came to mind, that of a neighbor who also happened to be the mayor of Bay Village. Later that year Sam Sheppard was convicted of second-degree murder. He was convicted in one of the most egregious miscarriages of justice ever committed in these United States. The coroner, who arrived quickly on the crime scene, was well aware that most murders of wives were committed by husbands, and took this as proof enough that Sam was guilty. He never looked for any exculpatory evidence. He convinced the detectives investigating the murder that Sam was the only suspect. The detectives impounded the house, taking the keys and allowing no one in without police supervision. They did allow Chip’s uncle and aunt to come pick up clothes for the boy, who was now staying with them. The keys were not returned to Sam’s attorney until a couple of days after his conviction. Sam Sheppard suffered neck and spinal injuries during his tussles with the murderer that could have resulted in paralysis or death. The coroner, looking at x-rays but never having examined the patient himself, pronounced the injuries self-inflicted, contradicting the diagnoses of the doctors who actually examined Sam. All appeals having failed, Sam served 10 years of his life sentence. Then Sam’s defense attorney died, and his cause was taken up by a young lawyer named F. Lee Bailey. In 1966, the U. S. Supreme Court struck down his conviction, because Sam did not receive a fair trial. He was retried by the State of Ohio, and found not guilty. Sam’s life was ruined. He lived less than four years after his retrial, dying of an encephalopathy associated with alcoholism. He eventually regained his license to practice surgery, but his skills were not what they once were, and his drinking did not help. Two patients he operated on died as a result of his malpractice. He ended his life as a professional wrestler. He was 46 years old when he died. Likewise, his son’s life took a very different course than it should have. He was robbed of both his mother and his father during his formative years. He did sue the state of Ohio for wrongful imprisonment, which for some reason required yet another trial. In order to recover money from the state, Sam had to be found “innocent”. The 1966 retrial had found him “not guilty”. Apparently, there is a distinction. The state of Ohio remained obstinate to the end. In 2000, the jury of eight refused to find the defendant “innocent”. 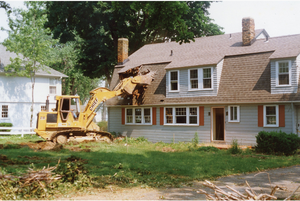 The house in which Marilyn Sheppard was murdered was torn down in 1993 to make way for a new home, one less engulfed in gruesome history. The photo at the top of this blog is from the day the deconstruction began. It is a sad story. There is no logical reason why I should be so fascinated by it.